How many points is a turnover worth? I’ve decided to kick off this blog by trying to answer a question my friends and I have pondered over the years. How many points is a turnover worth on average? Do interceptions have a greater value than fumbles, or do they both have about the same effect? What about other events like sacks? How much are they worth? The horizontal axis measures the difference between the number of “take-aways” and “give-aways” per game. Most teams average about half a turnover in either direction, but strong teams like Green Bay create on average nearly one more turnover than they commit. The vertical axis measures the difference between a team’s average points scored versus its average points allowed. Teams like the Raiders, Titans, and Jaguars were outscored an average of ten points per game or more, while New England outscored its opponents by about the same margin. The graph has the expected positive relationship; teams that create more turnovers than their opponents win by larger margins. There is a problem, though. The best-fit “least squares” line has an implausibly large slope of 8.7 points per turnover. Since a turnover results in zero, three, seven, or at most eight points, an average of over eight points per turnover is obviously too high. The problem is that teams that create more turnovers than they give up are often also more skilled in other aspects of the game. 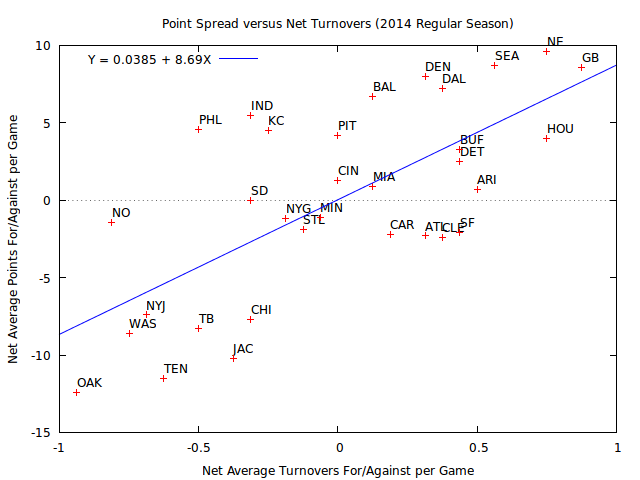 The right-hand side of the graph where teams that collect more turnovers on average are found has powers like Seattle, New England, Green Bay and Denver. While those teams may have an advantage over their opponents in turnovers, they have strengths in many other aspects of the game as well. 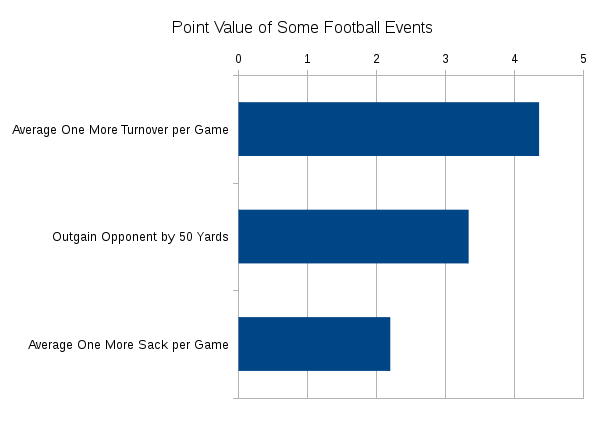 So the apparent effect of turnovers also indirectly measures a team’s abilities in rushing, passing, and kicking. Good teams do many different things well, one of which is turning the ball over less often than their opponents. What we need is a method of “controlling” for these other team factors so we can measure the effects of a turnover more accurately. There are obviously hundreds of football statistics we might use to predict scoring performance, but I’ve limited my attention to just three — yards gained or lost, turnovers, and quarterback sacks. As before, I’m using the 2014 NFL team statistics through week 16, augmented by ESPN’s compilation of take-aways and give-aways. A team that takes away one more turnover than it gives up scores on average 4.4 more points per game. A sack is worth about half as much. Using the same method a sack has the equivalent effect on scoring as gaining an additional 33 yards. While this “model” of football doesn’t include many other important features of the game like kicking, these three factors alone still account for over 80 percent of the variation in scoring. 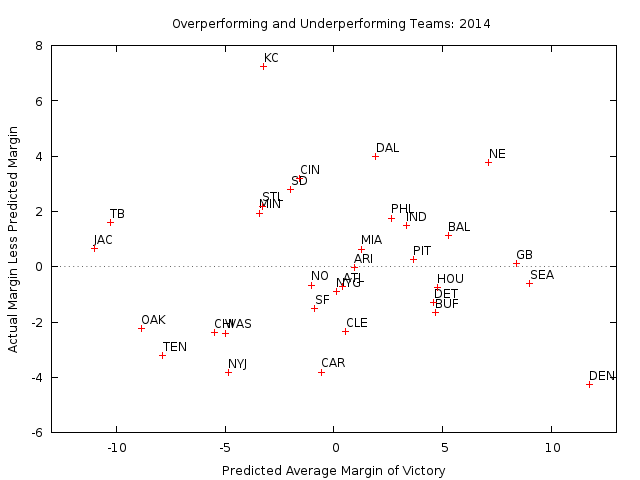 With that in mind, let’s ask how teams have performed this season compared to the model’s predictions. That gives us a method to identify underperforming and overperforming teams. The Kansas City Chiefs scored over a full touchdown more per game than we would predict knowing the team’s net yardage gained, turnovers, and sacks. The Cowboys and Patriots each averaged about four points more than our model predicts. The most surprising result has to be the Denver Broncos. The Broncos prowess in all three categories measured here predicts they should outscore their opponents by nearly twelve points per game rather than the 7.5 points they averaged through week 16. 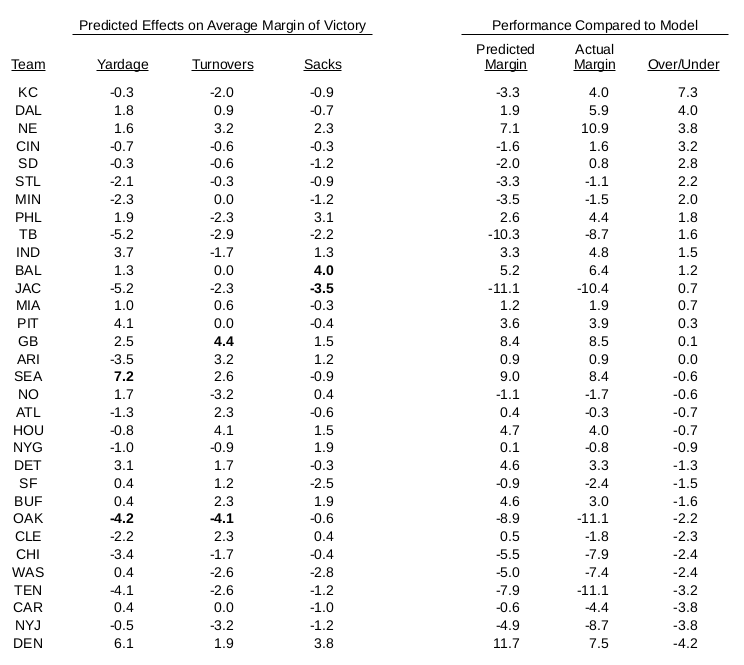 Here is a detailed accounting of the effects of each of our three factors on teams’ performances through week 16. I’ve bolded the largest and smallest effects in each category. Seattle leads the league in net yards gained at 101, which is worth 7.2 points. Hapless Oakland has the worst net yardage which costs them an average of 4.2 points per game, and the Raiders lose about the same number of points by averaging 0.9 turnovers more than their opponents. Green Bay gains 4.4 points from its league-leading turnover difference of +1.0. The Baltimore Ravens again show their defensive toughness leading the league at +1.8 sacks per game, worth 4.0 points on average. Jacksonville’s inability to protect its quarterback cost the Jaguars about 3.5 points per game. NET? RPI? Will it matter? How much does seeding matter? Did the Astros Spend Their Way to the Top?